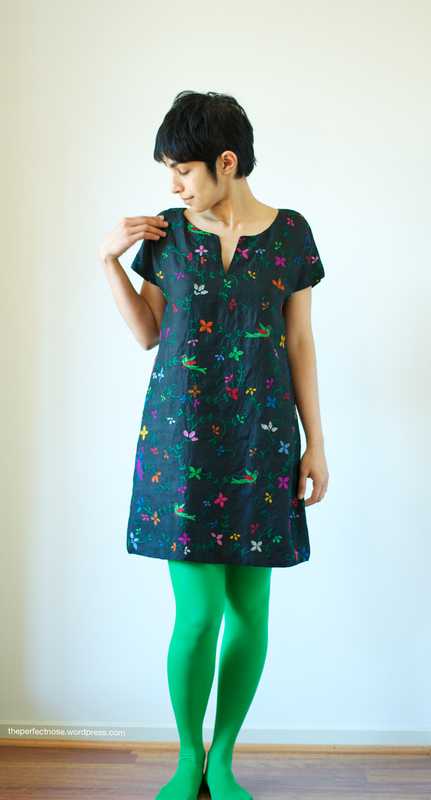 I used the heck out of this tunic through out the holidays. It’s such a deep, dark black that the tights look almost navy in contrast. Every other black fabric I own looks like some version of black (dark purple/dark blue/ dark brown) next to this silk. Yes I’m still covering last year’s makes-Epirus was the first dress I made this year (apart from finishing a couple of unfinished objects and two new tunics that I finished last week and haven’t documented yet). The front of the tunic is hand embroidered in heavy silk thread and cut from the pallu* of a vintage silk sari (see last image). The back is made from the inner portion of the same sari. The thick, raised texture of the embroidery makes pressing difficult however, due to the extreme blackness of the fabric, the wrinkles aren’t easily discernable except under very bright sunlight (as in the above images). The style of embroidery used is an Indian technique known as kantha. Kantha is a traditional style from West Bengal, originally used to recycle old saris into quilts and home decor (three or more saris were stitched together and their borders unravelled to harvest thread which was then used to embroider the saris together-almost like quilting but with animals and other motifs used instead of generic quilting whorls..). There are a couple of sweet closeups of stitch styles here and a mind-boggling array of random images here. I prefer the simpler styles with naive, almost line diagram-like motifs. The best part? It goes with almost every pair of tights I own. 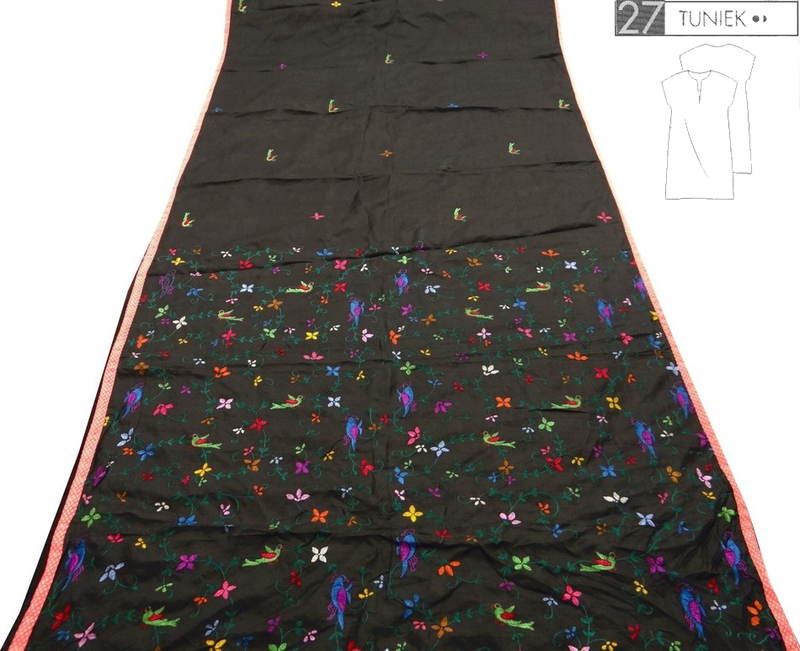 Fabrics used: Outer-jet black vintage silk sari with kantha hand-worked silk embroidery. 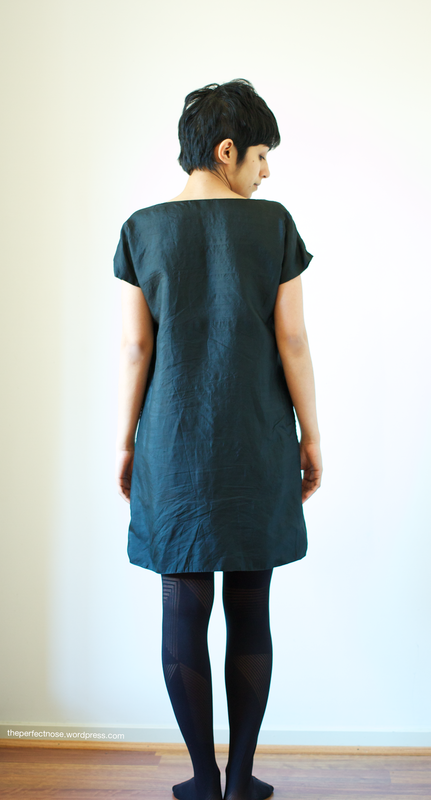 Lining– Jet black Japanese rayon from Charles Parsons (it feels like love). Pattern: Knipmode August 2011, Tunic 27. Modifications: Shortened by 2 cm at waistline and 6 cm at hem. Black geometric microfibre tights by Gatta. Green tights Gabriella (this style is not recommended because it’s fairly see through but it’s not meant to be). Comments: This is a fairly easy style to make without patterns or drafting. Just cut out a rectangle twice the length of the finished dress and slightly wider than your shoulders. Cut a hole in the middle. Then sew up the selvedges (or longitudinal edges) to a point that leaves comfortable sleeve gaps. And you’re done. You can widen the ends into a trapezoid for an A-line version or narrow them for a pegged silhouette. *The pallu is that part of a sari that drapes over the shoulder (or whatever else you feel the urge to drape it over). This is usually the most highly embellished part of a sari and can cover from a tenth to roughly a fifth of a sari.